Thanks to the Summer Camp Sponsors! Want to Sponsor a Girl Guide Camp? 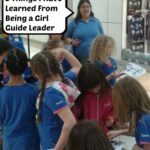 Girl Guides of Canada Finally Has a Blog! It’s about time! I’ve been waiting for Girl Guides of Canada to join in the blogging craze. First they started a facebook and twitter account and I knew it was coming. 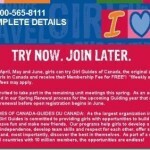 Check it out at http://girlguidescanblog.ca/ Stay up to date on all things Girl Guides! Attention Members of Girl Guides Past & Present! Girl Guides is celebrating 100 years of Guiding in 2010 and there is a facebook fan page that you are invited to join! Are you a fan of 100 Years of Girl Guides? Come be a fan and invite your Guiding friends and family members to join too!